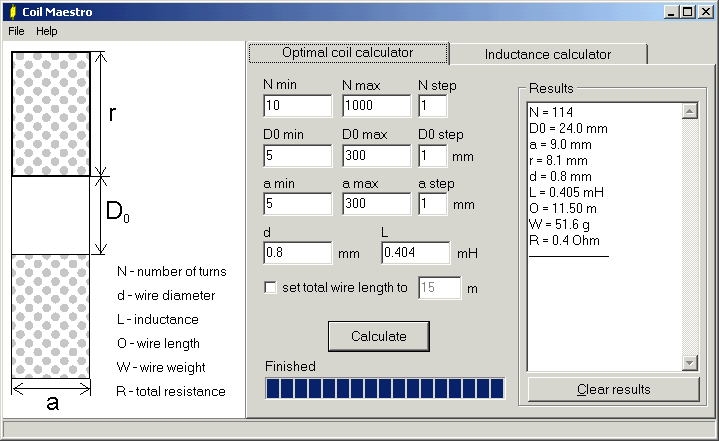 OVERVIEW: Program calculates optimal dimensions of coils for wanted inductance. It is simple to use but flexible so it can help you not just to make calculations but to find optimal measures or experiment with very flexible parameters. 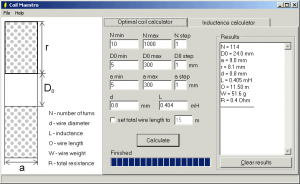 Aditionaly, program can calculate inductance based on physical dimensons of coil. REQUIREMENTS: Any computer running Windows 95, Windows 98, Windows 95 NT, Windows 95ME, Windows 95 XP, Windows 2000, XP, Vista or newer will do. USAGE: You should know some theory about calculating coils. 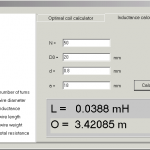 There ar two modes: optimal coil calculator and coil inductance calculator. 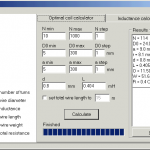 OPTIMAL COIL CALCULATOR isused when you have to make coil of known characteristics. It allows you to experiment with different coil parameters to get to the optimal values. If you set wide range of parameters, it will try to find most optimalby itself. Default values will help you understand how application works. There is also drawing explaining what is meaning of each parameter. Some parameters are presented as range. You may use this range to force specific values for that parameters. If you want to limit range to single value, just set both min and max to the same value. If you are not certain which range will do the best for wanted calculation, set large ranges. Calculation will take some time but it will give you some results. Our sugestion is to increase step value to cut the time. In that way you wil get rough caculation but, once you get it you will be aware what range you should set to get finer result. 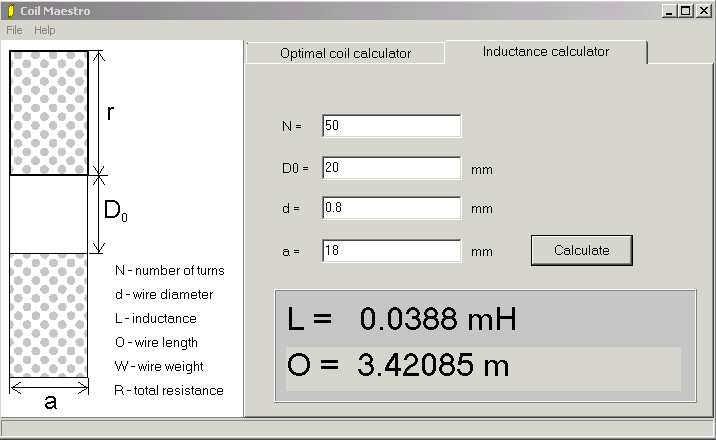 COIL INDUCTANCE CALCULATOR helps you calcualte inductance od the coil which dimensions you know. It is helpful when you get unknown coil so you can only measure it’s dimensions. I need to lift 100 gram weight, which is tied in the actuator. How much tesla or henries required to lift 100 gram weight? Well it depends upon how far away the weight is, and if it is magnetic, and what current is flowing through the coil. What I recommend is buy a frequency counter module for a few leva, then make a “Colpits’? Oscillator circuit. The one with about 10:1 tapped capacitor, with your L across it, the base, or gate of the transistor going via DC block to the big C at the top, and the emitter, or source going to the centre tap, and also through maybe 10k Ohms to deck. Have a bias pot to adjust the current through the transistor to a few milliamps, via c56k ?resistor, and then if your circuit has a reasonable Q, it will oscillate, and the counter will tell you f if you couple it’s input with a little loop, to your coil. I totally recommend “Panecal” download from Playstore. It’s perfect.